I’m going to be in TV! Only local, Canarian TV, mind you, and after 11 pm, but still TV. The have a programme about foreigners who’ve made their home in the Canaries, and they were looking for someone connected with the observatory. Luckily, someone suggested me. The TV crew are going to follow me around filming for hours on Tuesday and Wednesday, of which about 15 minutes will be broadcast. I’m a bit nervous, but it’ll be great practice for when I have books to promote. 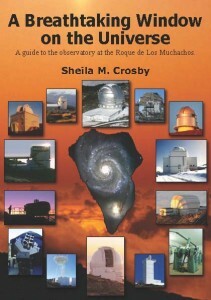 In fact I’m going to try to get a bit of publicity for my upcoming e-book on the observatory. Oh, I hope you’re going to record your 15 minutes of fame, so those of us without Canarian tele can watch it too. Blimey, a Television star! Can’t match you there Sheila, but I once had an article in People’s Friend.